Stewart: The kayak leg is my strongest discipline. I have been paddling and racing kayaks since I was 12 and most of my racing has been on white water. I have completed in 5 Wild Water World Championships with a best result of 9th as a Junior and 17th as a Senior, as well as a number of World Cup events with a best senior result of 9th. In Australia I have done three Avon Descents with my best results a 3rd place overall in K1 and a 1st place in the Interstate Challenge Ski Category. 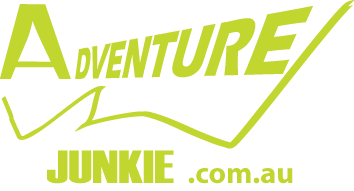 I have always done a bit of running and really enjoy trail running and have raced in the Tassie Trail Series, a few of the Running Wild events in Victoria and the Wonderlands Run in the Grampians. Cycling is my least developed leg and the one I am trying to improve the most. I have always enjoyed mountain biking but never trained seriously for it. I have been riding regularly over the past 18 months and are building my cycling legs up slowly. Q: What nutrition scheme would you use? Do you have any advice for newcomers on nutrition? Lisa: I would have breakfast before the race, then eat something at the end of the run and before beginning the kayak leg. I didn't do this last year and was very flat for the first half of the bike leg. Once on the bike I would again eat something and also carry something else for later on in case it's needed. For newcomers to racing- I think it's important to have a plan for nutrition and to practice it before the race to avoid having to make decisions during the race. Know what works for your body and think about the logistics of maintaining your intake while running, paddling and riding eg: making sure food is easy to get to when you need it. Stewart: I kept the nutrition pretty simple. I used an "endurance" type powdered drink mix that contained a mix of carbohydrate, electrolyte and protein. I carried a bladder on the run and sipped from that, I had another bladder in my boat that I drank during the paddle leg and then carried a bladder on my back during the bike leg. I just made sure I kept sipping this regularly and when I felt I needed it and felt good all race. It was a hot day for the 2016 Grampians so I was glad to have enough fluid and electrolyte on board. My only advice for newcomers is to keep it simple (i.e - keep your nutrition as convenient and hassle free as possible -especially on the paddle where you can't use your hands), keep your intake regular and commence it early in the race before you feel thirsty or hungry and practice consuming your food / drink while working hard prior to the race to make sure you like it and it feels ok in your guts. Q: What kind of craft did you use for the kayaking stage? Stewart: I paddled my K1 which was ok in the end but challenging at times in the wind and waves out on the lake. There was lots of water coming in the cockpit from the waves but luckily I had a good foot pump and could pump the water out during the stage. Lisa: I use a hardtail MTB and it was good for the climbing and sandy parts of the course. There was a rocky technical descent at the end which was a good test of skills! Stewart: I rode a dual suspension Giant Anthem. The mountain bike course is open and fast and my bike felt good. I light bike is beneficial for the first part of the mountain bike on the long and continuous climb so a hard tail over a dual suspension would be faster here perhaps, but I was grateful for my rear shock on the fast descent after the climb, sometimes over 60km/h and also on the steep and rocky final descent to the finish line which was quite technical. At the end of the day, it probably comes down to personal preference and skill level. I would use my dual suspension bike again next time. Q: Do you think your last year time can be beaten? Stewart: Of course they can be beaten! I had suffered from the so called Thunderstorm Asthma that affected Melbourne and surrounding suburbs a week or two before the event last year and was still having asthma symptoms on race day which was totally new for me so I was being pretty careful in the run in particular. The paddle conditions were slow due to the wind and so on a calm day, people could go a lot faster I think. I had a good ride last year but as this is not my strongest leg, I am sure someone can beat my time.